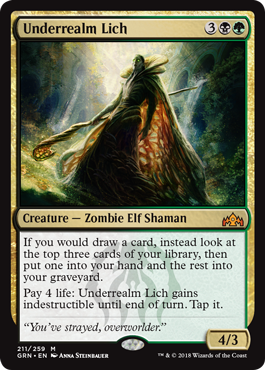 I almost feel like I should open with a warning that Underrealm Lich’s Sylvan Library callback is compulsory. Every time you draw a card, you use it and end up with two cards in your graveyard. If you draw multiple cards as part of one effect with the likes of Harmonize or Compulsive Research, you have to do it every time, so make sure you have plenty of time to look at all those cards! With that much card selection, it’ll be hard not to have exactly whatever cards you need at a given time, and even harder for your opponents to keep up. And on top of that, he basically can’t be killed – Golgari decks always have plenty of life points to spare, right? I’m sure there’s a joke to be had about Liches, the same joke I make every time we review a Lich. Underrealm Lich is very hard to remove, a pseudo-regenerate for zero mana, and it’s conceivable for a deck to simply be unable to remove the Lich by any means. Until your life total gets low enough, of course; while life is but a resource, 4 life to throw the shields up can add up fairly quickly. Of course, that’s not the sole reason to run the Lich, and the main draw is its draw replacement: if you’d draw a card, you get the best card of your top three (while not counting as a draw, if it matters). Between undergrowth, graveyard synergies, and even jump-start if you go into 3+ colors, Underrealm Lich makes it very easy to load up your graveyard and get exactly the cards you need. Should you run out of cards, not all hope is gone, as this is a draw replacement, and so long as the Lich lives, you can’t lose the game by attempting to draw from an empty deck. Underrealm Lich has a lot of power and is definitely mythic for being really stupidly powerful…a hard-to-kill threat that makes sure you get exactly what you want. As with all liches, power can come at a cost, and it’s possible for this undead abomination to backfire. But what fun is it when cards are completely “safe”?